MacAlly’s versatile new PowerTune is the best $50 U.S. iPod accessory ever. As a case, its rigid plastic is snug and secure, with full access to iPod dial and headphone port, but not on/off/hold switch. The speakers are tiny with midrange emphasis, but with enough presence to keep you entertained or informed by whatever is playing on the iPod under most listening conditions. Charging is efficient and almost effortless, with enhanced built-in battery capacity for your iPod. As a stand, PowerTune is stable, with sensible positioning. Speakers and charging indicator light are on lower front of PowerTune. Volume control, mini-USB port, and off/charge/play switch are lower rear. A clear front plate with circular hole hinges at the bottom and snaps shut at the top, onto the black rear business-end of the case. 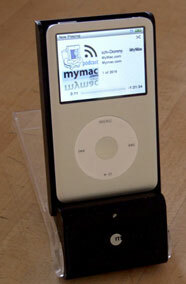 An iPod slips into a 30-pin dock connector that is just above the speaker section. MacAlly provides a self-adhesive foam shim to fill the gap between PowerTune’s black inner back and an iPod’s silver backside. Fit is snug, without much wiggle room. There is not a lot more to know. You can play or charge an iPod with or without the assistance of a computer, or external speakers or headphones. PowerTune fits into most front pants pockets, or nearly all tote bags or purses. Indicator LEDs notify you when charging is complete. Syncing or recharging PowerTune via the included USB cable is straightforward. Audio playback via headphones is easy as pie, as is operating an iPod’s click wheel controls. Playback from the built-in pair of 500mW speakers will leave you wanting more robust audio delivery, but will certainly satisfy most buyers who know value when they see and hear it. Rotating PowerTune’s clear front plate forward and underneath allows you to set it down on a table or desk with both screen and wheel exposed. PowerTune’s full set of features plus four photos are located at its web site. Wear and tear will blemish the clear screen protection area, so be aware of where and how you handle and carry it. I worry the plastic top snap will erode, and suggest that MacAlly redesign that aspect. I am not going to test how much extra power PowerTune’s 1050mAh Li-ion battery provides, because there are too many variables to that equation, but its built-in battery can only boost and not diminish and iPod’s battery capacity. “Approximately doubles” is MacAlly’s claim. The company does not include any written or website instructions for PowerTune, which is a mistake I’ve mentioned to MacAlly. You can expect to have additional information available by early 2008. MyMac.com is fond of MacAlly’s ingenious PowerTune, and we give it a high recommendation. With many more positive features than flaws or omissions, we rate it a strong 4 out of 5.